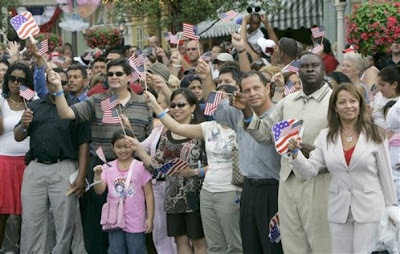 On July 3rd over 1,000 people will become new United States Citizens at the Walt Disney World Resort. This will be the largest of over 50 such ceremonies held across the country by the United States Citizenship and Naturalization Services (USCIS) during the July 4th weekend. Over 6,000 new citizens in total will be welcomed. The Ceremony to be held in the Magic Kingdom at the Walt Disney World Resort in Florida will include people from more than 100 countries and ranging in age from 18 to 82. The immigrants will take the Oath of Allegiance to the United States during a morning ceremony jointly hosted by Disney Parks and Resorts and United States Citizenship and Immigration Services (USCIS). 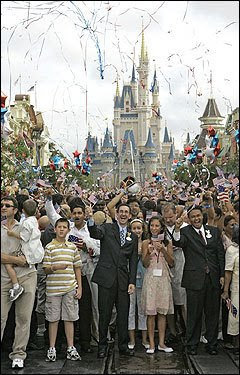 0 comments to "Over 1000 new U.S. Citizens Will Be Sworn In On July 3rd At Disney World"